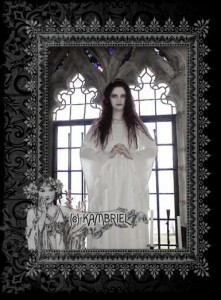 Kambriel offers elegant and luxurious Gothic clothing and accessories for men, for men and women, including flowing gowns, veils, priest cassocks, frock coats, capes, Victorian and Art Nouveau inspired velvet and lace chokers, custom designs, and many one of a kind items. Mostly nourished by a decadent and vampiric elegance, you'll find garments and night gowns perfect for a vampiress in spectral white, or bloody red. There's also a nice selection of victorian gentlemen's fashion. The overall impression is a collection that would fit perfectly the characters of Bram Stoker's Dracula, directed by Coppola. Vampires with a classic romantic air.